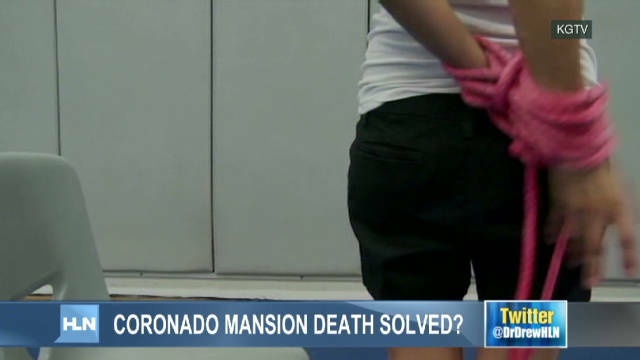 (CNN) -- Details from the autopsy of a woman found hanging from a California mansion -- including exact words of a painted message -- bolster her family's contention that she didn't commit suicide as authorities determined, the family's lawyer says. And a renowned forensic pathologist hired by the attorney says four bruises found on the top of the head indicate trauma not readily explained by the July hanging. He says that's just one of several reasons why he wouldn't have ruled Rebecca Zahau's death a suicide. "I would have left the manner of death ... as undetermined, because I think there are several things as far as I can see that have not been explained," Pennsylvania consultant Dr. Cyril Wecht, who viewed the autopsy report, said this week. Zahau family attorney Anne Bremner -- who even before seeing the autopsy report questioned authorities' findings that Zahau bound herself before hanging herself -- says she'll ask the San Diego County Sheriff's Department to reopen the case. "I think the facts and analysis (from a team of experts she is gathering) should compel them to reopen it," Bremner said. Zahau, 32, was one of two people who police said died as result of July incidents at boyfriend Jonah Shacknai's mansion in Coronado, California. Shacknai's 6-year-old son, Max, fell down the stairs July 11 and died at a hospital five days later. Zahau was found hanging -- naked, with feet bound and wrists bound behind her back -- in the home's courtyard from a rope tied to a bed in a second-story room July 13, police said. Police said Friday that there was no indication of foul play in either death and that evidence led them to determine Zahau committed suicide. But the San Diego County medical examiner's autopsy report, obtained late last week by CNN affiliate KFMB, contains details not mentioned during Friday's news conference, Bremner said. One is the wording of a message painted on the door of the bedroom where police say she threw herself from a balcony: "She Saved Him Can You Save Her." Police said Friday that the message existed but declined to reveal the wording, saying only that although it wasn't a clear suicide note, it appeared she painted it. Bremner says she's concerned someone else was writing about Zahau, rather than Zahau writing about herself. Zahau's family also says the handwriting isn't hers. Investigators aren't sure of the message's meaning, but they believe she wrote it because of evidence in the bedroom, San Diego sheriff's Lt. Larry Nesbit said Tuesday. At Friday's briefing, authorities said fingerprints and DNA on all relevant evidence -- including the bindings, the bedroom door and a paint tube found in the bedroom -- were hers. Because of the message's paint and block lettering, there is no way to analyze the handwriting unless investigators had a known sample of her painting on a door, Nesbit said. Police say Zahau, bound and naked, moved herself off this balcony and hanged herself. The rope was tied to a bed. Wecht, a forensic pathologist who has worked on many high-profile death cases, said four subgaleal hemorrhages -- between the scalp and skull on top of the head -- listed in the autopsy report may be inconsistent with the suicide theory. "You only get those from blunt force trauma," Wecht said. "That means your head struck something or was struck by something. I repeat for emphasis: four separate locations. The head is contoured; to have it bruised in different places, that means you have to strike different parts of the head." The report says "scattered superficial abrasions on her back and legs appeared consistent with impact with large plants under the balcony" but makes no mention of how the hemorrhages appeared on the top of the head. "Going by (investigators') scenario, (her) jumping from the balcony, there is no way I can understand how ... you get four bruises on top of the head." Wecht also noted that the autopsy report said gray material similar to tape residue was on Zahau's mid-left shin and lower right leg. In their briefing Friday, police did not mention tape. "Did she first plan to bind her legs together with adhesive tape, change her mind and say, 'No, I'm going to do it with rope'?" Wecht said. The report mentions that a portion of a shirt wrapped around the rope at her neck was in her mouth. "Why would she do that?" Wecht asked. "Was she afraid of waking someone up by screaming?" 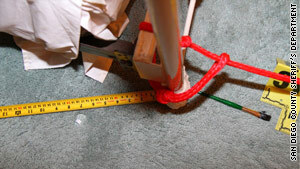 The rope used in the hanging was tied to this bedpost and bed frame, police said. -- The hemorrhages: "These were relatively minor. Because there was evidence that she went over the balcony in a non-vertical position, she may have struck her head on the way down." -- The possible tape residue: "These were small areas (about an inch), and their significance is not clear. Their position and size would have been unusual for evidence of leg binding." -- The T-shirt: "(It) ... had a portion originally in her mouth that was removed by the person who found her. It is not clear why it was there, although people can place material in their mouth prior to hanging." "None of the observations listed above are inconsistent with the conclusions reached regarding the cause and manner of death of Rebecca Zahau," Lucas said. Authorities first went to the home, in the San Diego suburb of Coronado, on July 11 after getting a call from Zahau's 13-year-old sister reporting that Max had fallen down the stairs and was not breathing, Coronado Police Commander Mike Lawton said last week. Zahau, her sister and the boy were the only ones in the residence at the time of the incident. Police arrived within two minutes, followed a minute later by firefighters who -- after finding the boy unconscious on the floor -- "began lifesaving measures immediately," Lawton said. But despite extensive medical treatment, Max Shacknai died July 16. Lucas, of the medical examiner's office, ruled the boy's death an accident, saying he died partly due to resuscitated cardiopulmonary arrest, cervical spinal cord contusion and blunt force trauma of the head and neck. On July 13, three days before the boy died, authorities got another 911 call from the home. This time, it was Jonah Shacknai's brother reporting that he found Zahau hanging, San Diego County Sheriff Bill Gore said Friday. Zahau's family says the 32-year-old wouldn't have known how to tie the knots and make the bindings. Shacknai's brother was staying in a guest house that morning, and he climbed onto a table and cut the body loose before investigators arrived, authorities said. Gore said Friday that investigators are comfortable with the brother's account. Jonah Shacknai -- a lawyer and the founder and CEO of Medicis Pharmaceutical Corp. -- was at a children's hospital or a Ronald McDonald House from the time when investigators believe the suicide happened to the time Zahau's body was reported, Nesbit said Tuesday. The autopsy concluded that Zahau was "alive when she went over the (second-floor) balcony" with a T-shirt wrapped around her neck, Lucas said at Friday's news conference. He said there was no evidence of a struggle or a sexual assault, or that she was rendered unconscious or incapacitated, adding that "her feet were dirty, consistent with standing on the dirty balcony." Authorities said the bindings and the hanging rope appeared to be cut from the same thing: apparently a watersport tow rope. Sheriff's Sgt. Dave Nemeth said of the slip knots on her wrists and neck: "There would not appear to be anything expert about it," he said. Zahau's family says the former technician at an eye and Lasik center wouldn't have known how to make the bindings and knots. Wecht said that although it is possible that someone can bind themselves, questions need to be asked about how she came to know how to do it. "My sister does not have knowledge of that kind. None of us really do," Mary Zahau told HLN's Dr. Drew Pinsky on Tuesday, referring to rope-tying. "We didn't even grow up around water. So the little bit of swimming that we know, we have learned after we have been grownups." Though investigators don't know the order of events, they believe she removed her clothing, painted the message, cut the rope into sections, secured the long portion to the bed, bound her feet, placed the rope and the shirt around her neck, fashioned wrist bindings, secured her hands behind her back, moved to the balcony, leaned over the rail and fell, Nemeth said. Lucas said Friday that although bound suicides aren't common, he has seen such victims and read reports of them. 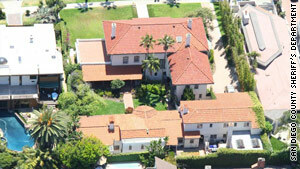 Zahau lived at the Coronado, California, mansion of her boyfriend, Jonah Shacknai, police say. "The thinking is, they bind themselves so that they won't change their mind midway through," Lucas said. 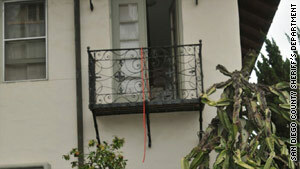 Authorities showed reporters video of an experiment examining whether someone could bind themselves with a similar rope. The video shows a woman making knots and loops around her hands in front of her, taking one wrist out to move her hands behind her and then rebinding the wrists. A set of footprints on the dirty balcony was consistent with the size of Zahau's feet, Nemeth said Friday. Toe impressions further ahead "were consistent with a person moving up next to the railing and leaning forward and going over the railing," Nemeth said. Nemeth said one person told investigators that in January, Zahau had "lost weight, seemed stressed, was not sleeping well and was not exercising, which was abnormal for her." Other interviewees indicated that "Rebecca was distraught over Max's injury," Nemeth said. But Bremner said that one of Zahau's sisters, who talked to her the night before her death, said Zahau "was completely fine" and didn't feel guilty about Max Shacknai's fall. Mary Zahau told Pinsky last week that Rebecca Zahau had never hinted at suicide. "My sister never had a psychiatric problem, never (had) been on psychiatric medication and never had attempted suicide, let alone ever talked about harming herself," Mary Zahau said. Nesbit said the sheriff's department is aware of the concerns raised by Wecht and that none of them alters its confidence in its investigation or the medical examiner's suicide ruling. "We're standing by our investigation," he said.